The Interchurch Center was first envisioned as a tangible symbol of growing unity and of joint service in Christian enterprises better done together than separately. After years of persevering effort by dedicated workers, the inspired dream became a reality when on November 17, 1957 the ground breaking ceremonies for The Interchurch Center took place. On May 29, 1960, the completed edifice was dedicated in moving ceremony that marked the official opening of a new chapter in the movement for a greater unity among churches in the United States. 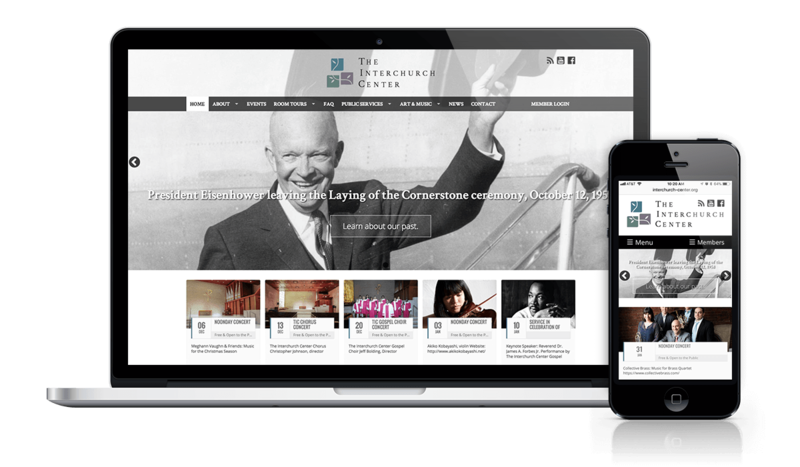 When Interchurch Center approached us about building a new web presence they knew there had to be a better way to foster communication between their tenants and showcase their historic building. We worked closely with the stakeholders at the Interchurch Center to help them develop strategies and a solution that allowed them to communicate effortlessly with their tenants and showcase all their good work to the public.